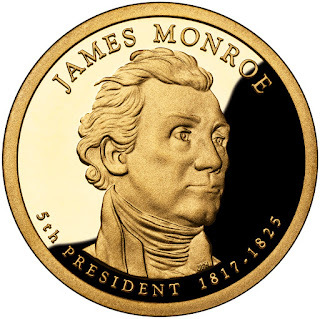 The 2008 James Monroe Presidential Dollar was released on February 14, 2008. The coin represented the first release of the year for the Presidential Dollar series and the fifth release for the series overall. Before being elected as President, James Monroe served in the Revolutionary War, championed the Bill of Rights, and helped negotiate the Louisiana Purchase. His Presidency is known for the Monroe Doctrine and Missouri Compromise. He served two terms as the 5th President of the United States from 1817 to 1825. The official launch ceremony for the James Monroe Presidential Dollar was held at Ash Lawn-Highland in Charlottesville, Virginia. This is the estate of President James Monroe. The Acting Deputy Director of the United States Mint Dan Shaver, Ash Lawn-Highland Executive Director Carolyn Coggin Holmes, and the James Monroe Memorial Foundation President G. William Thomas Jr were in attendance. 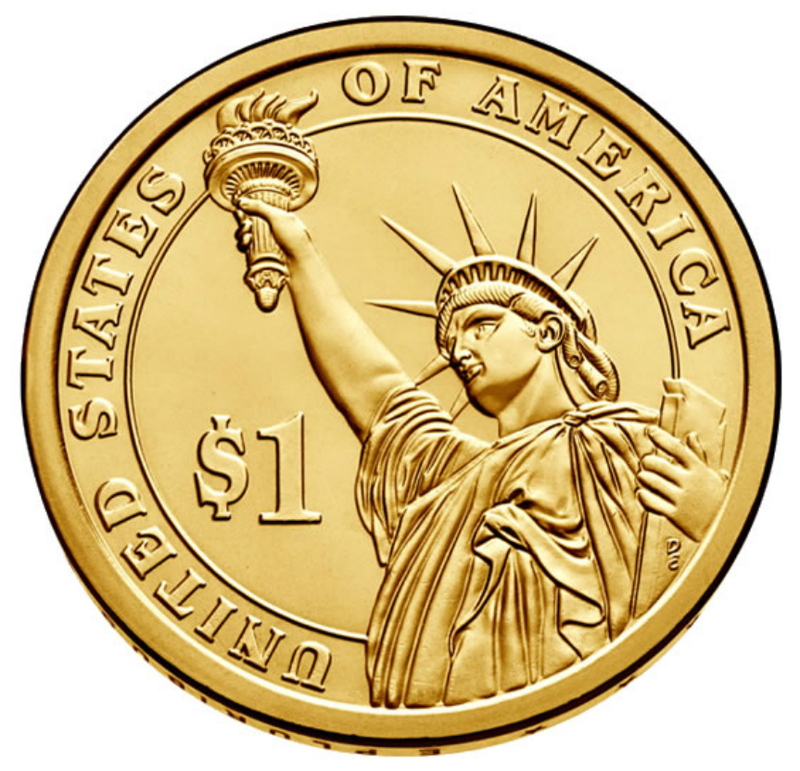 The public was able to exchange paper dollars for the new dollar coins one day before they were officially released into circulation. The obverse of the James Monroe Dollar coin features a portrait of the President and the reverse features the Statue of Liberty design used on all Presidential Dollars. The obverse was designed and sculpted by Joseph Menna. The reverse was designed and sculpted by Don Everhart. Mintage levels for the series showed another decline with the release of the James Monroe Dollar. The Philadelphia mint produced 64,260,000 coins and the Denver mint produced 60,230,000 coins. These figures marked another fresh low for circulation strike Presidential Dollars. Just before the James Monroe Presidential Dollars were released into circulation, there was some excitement with collectors when it was reported that between 70,000 and 140,000 had been struck on quarter planchets. The errors were discovered during the coin wrapping process and collected and returned to the Mint to be destroyed. So far, none of these error coins is known to have escaped into the hands of collectors. James Monroe (April 28, 1758 – July 4, 1831) was the fifth President of the United States, serving between 1817 and 1825. His time in office is known as the “Era of Good Feelings” for the peace and booming economy the country enjoyed. Monroe was the last president who was a Founding Father of the United States and the last president from the Virginian dynasty and the Republican Generation. Born in Westmoreland County, Virginia, Monroe was of the planter class and fought in the American Revolutionary War. He was wounded in the Battle of Trenton with a musket ball to his shoulder. After studying law under Thomas Jefferson from 1780 to 1783, he served as a delegate in the Continental Congress. As an anti-federalist delegate to the Virginia convention that considered ratification of the United States Constitution, Monroe opposed ratification, claiming it gave too much power to the central government. He took an active part in the new government, and in 1790 he was elected to the Senate of the first United States Congress, where he joined the Jeffersonians. He gained experience as an executive as the Governor of Virginia and rose to national prominence as a diplomat in France, when he helped negotiate the Louisiana Purchase in 1803. During the War of 1812, Monroe held the critical roles of Secretary of State and the Secretary of War under President James Madison. Monroe supported the founding of colonies in Africa for free African Americans that would eventually form the nation of Liberia, whose capital, Monrovia, is named in his honor. In 1823, he announced the United States' opposition to any European intervention in the recently independent countries of the Americas with the Monroe Doctrine, which became a landmark in American foreign policy. Monroe’s presidency was also marked by the Missouri Compromise, which preserved a balance of free states and slave states in the United States and prohibited slavery in western territories above the 36/30’ north latitude line. His presidency concluded the first period of American presidential history before the beginning of Jacksonian democracy and the Second Party System era. Following his retirement in 1825, Monroe was plagued by financial difficulties. He died in New York City on July 4, 1831. — Act of January 14, 1818 — This Act directs the location of the United States Mint to remain in Philadelphia for another term of five years, beginning March 4, 1818. — Act of March 3, 1819 — This Act continues the authorization of certain gold and silver coinage from foreign countries as current and legal tender for the payment of debts within the United States. Specific rates of exchange are enumerated for the coins of Great Britain, Portugal, France, and Spain. — Act of March 3, 1821 — This Act continues the provisions of the Act of April 29, 1816, relating to the legal-tender value of French coins. 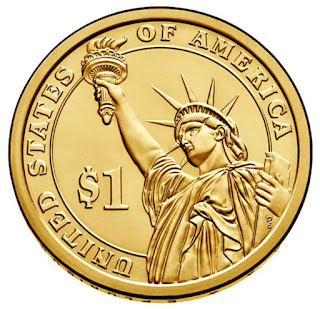 — Act of March 3, 1823 — This Act authorizes certain gold coinage from foreign countries as current and legal tender in all payments on account of public lands within the United States. Specific rates of exchange are enumerated for the coins of Great Britain, Portugal, France, and Spain. The Act also calls for an annual assay of such coins, and for a report to the Congress detailing the results. — Act of March 3, 1823 — This Act directs the location of the United States Mint to remain in Philadelphia for another term of five years, beginning March 4, 1823.